Hamilton resident Jimmy Cooper (center) is led by Marion County Sheriff’s Department deputies into a Marion County Courtroom on Friday, March 4, for a preliminary hearing. Details about the Wednesday, Feb. 10, murders of Hamilton residents Donnie Miller and Linda Cole were released for the first time in the 80-minute session. Marion County Circuit Court Judge Lee Carter determined enough evidence was presented to carry the case over to a grand jury. Shown leading Cooper into the courtroom are (from left) sheriff’s investigators Chris Sims and Daryl Spencer. Shown behind Simms is investigator Damian Allen. HAMILTON - The first of two murder victims never saw his attacker while the second was given a short time to plead for her life before being killed in her office by a man she had known for many years. This was the horrific picture painted by the only witness in a hearing for alleged murderer Jimmy Cooper before the case was handed over to a grand jury by Marion County Circuit Court Judge Lee Carter. 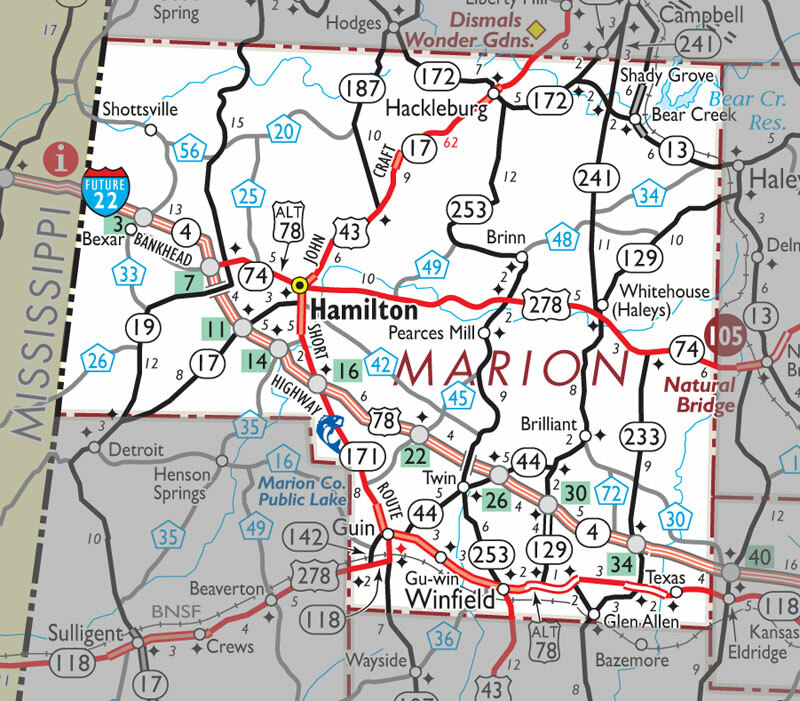 The preliminary hearing was held on Friday, March 4, in a small third-floor courtroom at the Marion County Courthouse in Hamilton. Cooper is currently being held without bond at the Marion County Jail in Hamilton for his alleged role in the shooting deaths of Donnie Miller and Linda Cole--both of Hamilton--on Feb. 10.
Cooper suffered from non-life threatening injuries as law enforcement officials ended the rampage. Details of the shootings in the downtown district began to emerge for the first time from the deadly events which began at attorney Scott Hunt’s office before spilling over into the local accounting office of Lawler and Cole less than two blocks away. Marion County District Attorney Jack Bostick called only one witness in the hearing-- Marion County Sheriff’s Department Investigator Jeff Davis, who is serving as the lead investigator in the murders. Early in the questioning, Davis noted he had been in Hackleburg at the time of the shootings, but immediately responded when learning of an active shooter situation over his radio. Between questions from the district attorney and defense attorney Brian White of Decatur, Davis remained on the stand for about 80 minutes. In this time, the law enforcement officer retraced the steps from that Wednesday morning when Miller and Cole were killed. While family members of the victims joined others in the small, standing-room-only courtroom and listened, Davis explained details from the two shootings, including the fact Miller was shot five times and Cole was shot three times. Beginning near the end of the story as law enforcement officers subdued Cooper near the scene of the second killing, Davis described how the man pointed his handgun toward a Marion County Sheriff’s Department investigator when the officer first arrived at the scene near First State Bank of the South--a structure which shares a property boundary with the accounting office where Cole was killed. Davis noted that Cooper was handcuffed at the scene before being transported by ambulance to North Mississippi Medical Center-Hamilton. He was later transported by air to the University of Alabama in Birmingham Medical Center. Spending several days in the Birmingham hospital prior to transport to the county jail in Hamilton, Cooper remained under guard by multiple officers with the State Bureau of Investigation. In questioning from Bostick, Davis’ recollection of events moved back to the beginning of the deadly rampage. The investigator described arriving at the law office only to find Miller’s lifeless body in the floor inside Hunt’s personal office near the rear of the building. Either during his response to the district attorney or in followup questioning by the defense, the investigator explained how Cooper arrived at Hunt’s office asking to see the attorney. Informed by his secretary of Cooper’s arrival, Hunt had granted permission for the man to walk down the hallway to his personal office. Cooper spent 45 minutes awaiting the arrival of his first victim before the shooting began. During this time, Davis said Cooper shared general comments with Hunt about his “life being ruined’’ while never offering specific details. According to Davis, this time allowed Cooper to tell Hunt of his anger toward Cole as she had “messed him up on taxes.’’ Cooper had also noted his fear there were those who would harm his family. The investigator also noted comments from Cooper while in Hunt’s office, pointing to a local motorcycle club as ones the Hamilton man feared. But Davis said law enforcement had never had any known issues with the club. Cooper also mentioned past issues with Miller, who had co-owned a business with him, but the partnership was in the midst of being dissolved. Davis said a lawsuit by Miller had been filed against Cooper as a result of the business dealings. The two had owned an insulation company. Hunt was Miller’s attorney in regards to dissolving the business partnership and had served as the legal counsel for the insulation company. Davis added that Cooper’s eyes were bloodshot, according to Hunt, who said Cooper had also mentioned not sleeping in days. Under sworn testimony, the investigator said Cooper had instructed Hunt to call Miller to his office. After Hunt had made the call and Miller had agreed to come, Cooper then informed the attorney of his intention to shoot both him and Miller. This is when the 45-minute wait began. Upon arrival, Miller walked toward the back of the office toward Hunt’s personal office. Turning to enter the large office area, Miller began walking toward the attorney only to be shot four times from behind as Cooper had taken a position near the office door. According to Davis, it was at this point Miller fell to the floor. Hunt has since stated while questioned by authorities that Cooper never allowed him to leave his sight while the two men were waiting on Miller to arrive. Attempts to signal his secretary to notify authorities were not possible since Cooper never left Hunt’s side. Davis said Hunt had not seen any weapon in Cooper’s possession during the wait. The attorney has stated in his questioning by authorities that the first time he had seen the weapon was as the shooter removed the handgun from his jacket pocket and began to fire. Davis said that according to Hunt’s recollection of events after the shooting, Cooper then began walking toward Hunt while making adjustments to his weapon while threatening his life, as he began taking steps toward the attorney. Hunt began to plead for his life, noting he was the father of two young boys. At this time, Davis said the handgun malfunctioned while Hunt began talking to the man who had just shot the attorney’s client as he watched. Correcting the issue with the weapon, Cooper glanced at Hunt prior to firing another round into the lifeless body before leaving the office. Having fired the final shot into Miller’s body, Cooper told Hunt he was not to report what he had seen, according to the investigator’s testimony. Davis would later testify that Cooper simply walked by Hunt’s employees as he left the office, all the while with his right hand inside his coat pocket. Surveillance video has been provided showing Cooper leaving the law office as he began his continued journey on foot southward toward the accounting office. Cooper is believed to have walked to Hunt’s office based on a statement from Cooper’s brother and the fact no vehicle belonging to Cooper was found in the area thereafter. Davis said Cooper entered the Lawler and Cole office and walked directly toward a locked door which separates the lobby from a private office area used by accountants at the firm. Cooper then asked the receptionist if he could see Cole, at which time he was informed she was with a client. Telling the receptionist he had one question for her, Davis said the receptionist asked for his name. At this time, Cooper provided a false name, Jake McGee, to the receptionist. In seconds, Cooper was on the phone with Cole and would later tell the receptionist he had permission to see her. Davis would later note there is no way to know what the actual exchange was over the telephone between the two parties. No employee is believed to have unlocked the door leading to the private office space at the accounting firm for Cooper. Davis said other clients were leaving the private office area with Cooper using this brief opportunity as his chance to grab the opened door and enter the area where Cole’s office was located. Witnesses also noted Cooper’s right hand never left his coat pocket during this entire turn of events. Shortly after Cooper walked through the door and into the private office area, he walked into what had previously served as Cole’s private office years earlier when he had used Cole as his accountant. He was informed her office had been moved across the hall. At this point, Cooper entered Cole’s office briefly where the two are reported to have exchanged words. Immediately thereafter, the witnesses reported hearing three shots fired, all of which authorities would later learn had struck Cole in the back and killed her after she had walked from her office and into the adjacent hallway. The investigator answered multiple questions from the defense attorney that there are no reports of either Cole or Miller having any last words after having been shot. Other eyewitnesses have reported, according to Davis, that Cole raised her hands in the waning seconds before she was killed while pleading for her life. Davis confirmed that there is video footage of what transpired in the main lobby of the accounting office, but no such footage exists from the private office space where the accountant was eventually killed. Davis said Cooper left the accounting office and began to walk toward the bank. This is when he first encountered a Hamilton police officer and Marion County Sheriff’s Department Investigator Lt. Damian Allen. Davis testified Leon Webb of Hamilton and his wife had been in the accounting office at the time of the shootings. The couple fled out the front door after hearing the shots. Only a few seconds later, as Webb was entering his personal vehicle, he looked up to see Cooper rushing out of the front door and turning toward the bank. The couple did not speak with the shooter nor did Cooper attempt to speak with them. Davis said as the officers arrived, Cooper raised his gun in Allen’s direction as the officer was attempting to bring his sports utility vehicle to a stop. The officer returned fire with Cooper being struck in the leg. At the scene with Allen were Marion County Sheriff Kevin Williams and two officers with the Hamilton Police Department. Davis said a civilian was also at the scene as the exchange ended. Dustin Dulaney had been at the accounting office at the time of the shooting, according to Davis. He said the bystander borrowed a handgun from Webb and began running in the direction Cooper was seen fleeing. Davis confirmed Dulaney is believed to have fired one round from Webb’s handgun. This shot is not believed to have struck Cooper. While the Marion County Sheriff’s Department is now handling the investigation of the two murders, the State Bureau of Investigation is taking the lead on the officer-involved shooting, which is the standard protocol in such cases. The investigator also noted multiple witnesses from the various scenes were taken to the sheriff’s department for interviews. Participating in the various interviews were officials from the Marion County Sheriff’s Department, Marion County District Attorney’s Office, the Hamilton Police Department and the State Bureau of Investigation. Questions from the defense led Davis to acknowledge that while no statements concerning the shootings have been given to him by Cooper, the officer had heard second- and third-hand accounts of a few statements the shooter was alleged to have made. Toxicology reports from state forensics are pending in the case, according to Davis, who said it was unclear if Cooper was intoxicated or on medication at the time of the shootings. The investigator said he had attempted to speak with Cooper upon his transport to the Marion County Jail, but the accused had immediately asked to speak with an attorney. Late in his testimony, Davis confirmed the weapon used in the shootings was a 5.7 automatic pistol. Discovered at the scene after his arrest were two additional magazines full of ammunition, as well as the one still remaining in the weapon. One magazine was found with the weapon while the second was inside Cooper’s coat pocket. Davis was uncertain as to the exact number of rounds were represented by the magazines. Questioned as to how the shooter came in possession of the handgun, Davis testified Cooper’s brother had taken ownership of the weapon as part of a recent trade involving a motorcycle. Authorities with Alcohol, Tobacco and Firearms (ATF) have the information on the origin of the weapon. This information is yet to be made public. In his testimony, Davis also noted there had been talk in the community of tension between Cooper and Miller, but that no such report had been filed. In direct response to a question from White, Davis said such news travels quickly in small communities. He also noted that while Cole had previously served as Cooper’s accountant, she had not done so in more than 13 years. Ending the hearing, Davis was asked of his knowledge of any prior mental illness with which Cooper had suffered. Davis confirmed that the sheriff’s department had been asked to transport Cooper to a facility in Walker County in July 2015--a stay which lasted for three weeks, according to the investigator, before he was transported to another mental facility in nearby Townley for an additional three weeks. Cooper’s brother, Dwight, signed the petition to have him committed. Davis also said he was not aware of any previous criminal history for Cooper. Spending more than an hour on the witness stand, Davis was dismissed with Carter saying the court had found sufficient evidence to turn the case over to a grand jury. Although Cooper could be seen shaking his head in apparent disagreement with Davis’ testimony numerous times during the hearing, the defendant said nothing during the session. Prior to the arrival of Judge Carter, Cooper was seated at a table in front of the bench with his attorneys--White and co-counsel Jake Watson of Huntsville. Leaning over to White, the defendant noted the presence of photographers inside and outside the courthouse at the time of his arrival. Cooper questioned if such was allowed. He was informed by his legal team that such was legal, but cameras would not be allowed in the courtroom. Cooper was overheard asking if his defense team could use the media publicity for its advantage, to which White simply noted he would prefer to have less media coverage.